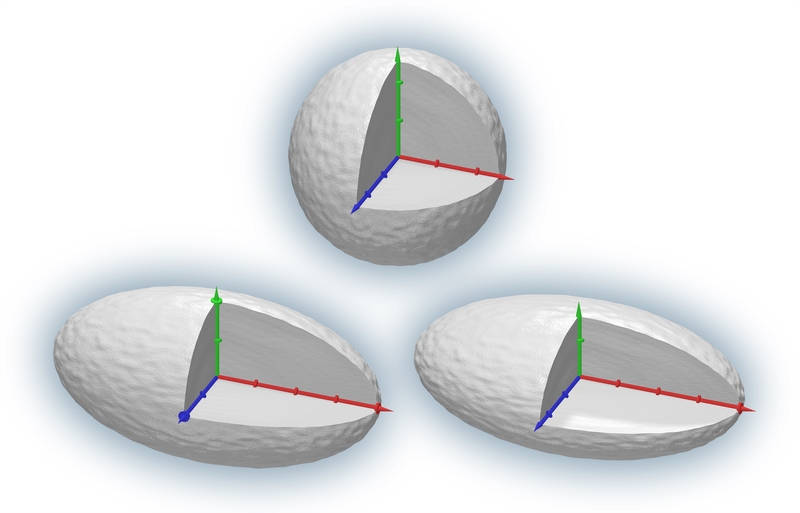 The nuclei of atoms of heavy elements do not necessarily take a spherical shape: they may be variously extended or flattened along one, two or even three axes. An international team of physicists, led by scientists from the Institute of Nuclear Physics of the Polish Academy of Sciences in Krakow (IFJ PAN) and the Heavy Ion Laboratory at the University of Warsaw (HIL), has recently presented the results of experiments showing that complex superdeformed nuclei occur in much lighter elements as well. The majority of heavy atomic nuclei do not look at all like a perfect sphere, but are subtly flattened or extended. The prestigious journal Physical Review Letters has published results of experiments evidencing that highly explicit and complicated deformations, thus far observed solely in heavy nuclei, do appear in lighter elements such as calcium. The research was conducted by scientists of the Institute of Nuclear Physics of the Polish Academy of Sciences (IFJ PAN) in Krakow and the Heavy Ion Laboratory, University of Warsaw (HIL) along with broad international cooperation. "Regarding that, we've known for several years that the nuclei can be slightly deformed even in light elements. Our experiments, however, have shown that in the case of calcium 42Ca they come to a particularly clear and complex deformation, called a triaxial superdeformation. Similar effects have been observed, but only in heavy elements, built from approximately 130-170 protons and neutrons," explains Prof. Adam Maj (IFJ PAN), who along with Prof. Faical Azaiez from the French Institut de Physique Nucléaire d'Orsay was one of the originators of the search. Atomic nuclei contain from one proton to more than 200 protons and neutrons. Glued together by strong forces, which overcome powerful electrostatic repulsion between positively charged protons, the nuclei are structures shaped by very complex quantum phenomena. The dynamics of the processes occurring here is so fast that observing the atomic nucleus over a sufficiently long period of time (in the microworld, still only fractions of a second), we see the nucleus only as a statistically averaged shape. In some cases, it is simply that of a sphere. Since the 1950s, however, researchers have observed nuclei which are elongated, sometimes significantly, such as an ellipsoid with one axis twice the length of the 2 others - such a case is known as nuclear superdeformation (relatively common nuclei are also found stretched at an axis ratio of 3:2). 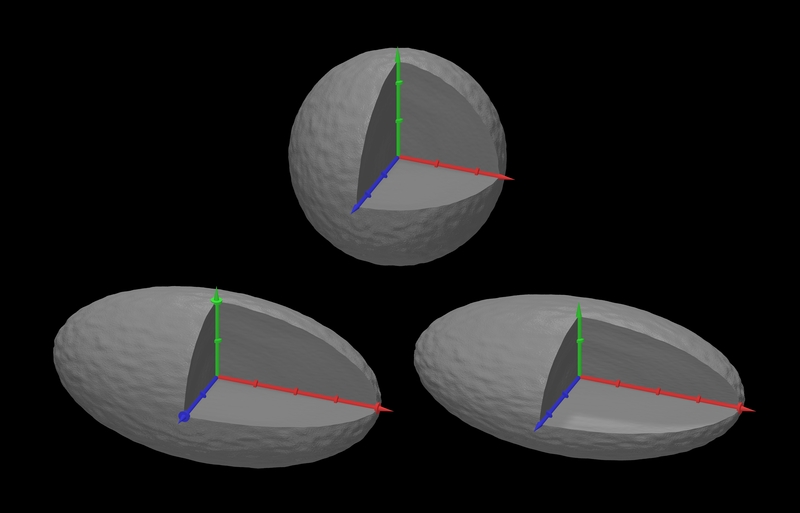 At this distortion it is possible to become more refined, as large deviations from the spherical shape occur not only along one, but even along three axes. The distorted nuclei, known as super-deformed triaxial, have so far been observed only in heavy elements. Atomic nuclei have a size of several femtometers, or one quadrillionth of a meter. Direct observation of such small objects is, of course, impossible. Information about their structure relies more on indirect methods, by analyzing the gamma radiation emitted by the nucleus passing from states of higher energies to states of lower energies. Depending on the structure of the nuclei and the method of their excitation, the nature of the resulting excited state may differ: the nucleus can vibrate in various ways as a whole, but can also, for instance, be activated to spin. The Polish physicists are especially interested the latter, spinning, states. Currently, Coulomb excitation is the most reliable method to observe deformed nuclei, a process in which nuclei are excited as a result of collisions occurring exclusively through electromagnetic interactions. As a result, the theoretical description of the phenomenon can avoid accounting for the extremely complex strong interactions, and in practice the use of well-known tools of classical electrodynamics is sufficient. Experiments on superdeformed light nuclei were based on very careful observation and detailed analysis of the gamma radiation emitted by the nucleus of calcium 42Ca, caused to spin as a result of a collision with a target constructed of lead 208Pb or gold 197Au (each 42Ca nucleus was striking the target nucleus with the kinetic energy of 170 MeV, or million electron volts). The measurements were carried out at the Italian INFN Laboratori Nazionali di Legnaro (LNL), and they were used in the AGATA gamma radiation detector. This detector, the most advanced of the gamma-ray Germanium detectors currently in use, is the product of international cooperation and is characterized by an extremely high power of resolution. The experiment concerning superdeformation of the nuclei of calcium was the first one using this sophisticated device. "While processing the data provided by AGATA, we used many methods and tools, such as the well-known GOSIA program for analysis of Columb excitation, which has been under development for several years at the Heavy Ion Laboratory in Warsaw. It turns out that the excited 42Ca nuclei are superdeformed and at the same time triaxial, which is confirmed by calculations using advanced theories of the structure of the atomic nucleus," says Dr. Katarzyna Hadynska-Klek (HIL), who led the analysis of the data. Exciting 42Ca nuclei to the superdeformed triaxial state requires relatively low levels of energy (approx. 2 MeV), and because the superdeformed energy state is very near the basic spherical state, we can talk about a certain state of coexistence between the two states. "A full analysis of the data collected in Legnaro took us three years. Along the way we had to conduct another, complementary experiment at the Warsaw cyclotron. Its results exclude one of the alternative variants of interpretation of the AGATA detector," says Dr. Pawel Napiorkowski, the project leader at HIL. The discovery of triaxial superdeformation in 42Ca will help physicists to better understand the phenomena in atomic nuclei. Modern theoretical tools do not allow for accurate modeling of nuclei with an atomic number far exceeding 40, which has limited the development of research into superdeformation. Meanwhile, in the case of calcium many theoretical obstacles disappear. It is also likely that the measurements and analysis will be used in the future to search for other superdeformed states at low excitation energy, including a longer life-span than the typical quadrillionths of a second. Finding such states would allow scientists to turn our attention to the formation of what is known as inversion, a scenario in which the majority of nuclei are attained not in the ground state, but in the excited state. This would be a significant step towards building a nuclear laser capable of emitting coherent nuclear gamma radiation. Cooperation between the centres of Krakow and Warsaw is done within the consortium of the National Cyclotron Laboratory. Scientists from many countries have played an important role in the research, in particular Dr. Jose Javier Valiente Dobon (INFN LNL, Italy) and Dr. Magda Zielinska (HIL, Poland; CEA, France). In Poland, research was funded by grants from the National Center for Science and the European Union.